Three Republican candidates square off tonight in a primary for the Virginia Senate seat in the 14th district. The retirement of Harry Blevins opened up the seat, which will be contested in a special election on August 6. The three candidates are Del. John Cosgrove, activist Chris Stearns, and former Chesapeake council candidate Bill Haley. So far, no Democratic candidate has emerged to take on the winner, although some have it under consideration. 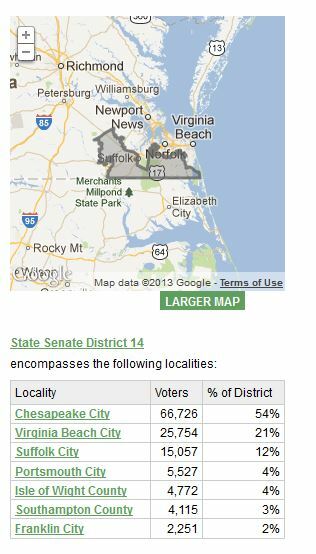 No wonder – this is a district in which Romney beat Obama by 21 points and Allen beat Kaine by 18. At the onset, I would have said that Cosgrove was an odds-on favorite – and that might still be the case tonight. But from all that I’ve heard – I don’t live in the district – Stearns has run an ambitious campaign. If you live in the 14th, check out the candidates as well as the polling locations, which will be open from 5pm to 8pm tonight. All of that information can be found in this article’s sidebar. OK — I’m a bit confused here. Don’t we have State elections in November? Is the Senate going to be in session between August and November? So why are they spending money on a special election? Better yet, why does a politician offer himself to serve and represent his constituents for a term of office, and then quit half-way through the term? That’s a question for the governor. He gets to decide when special elections are held.